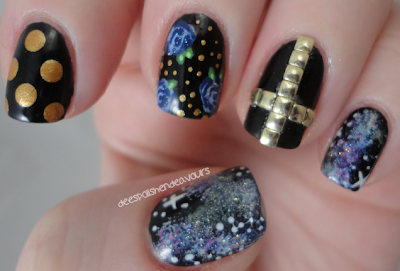 Galaxy, Dots, Studs, and Floral - oh my! I am really excited to share my nails with you all today.. Exceptionally excited! My sister (who is awesome) sent me an inspiration photo via text. 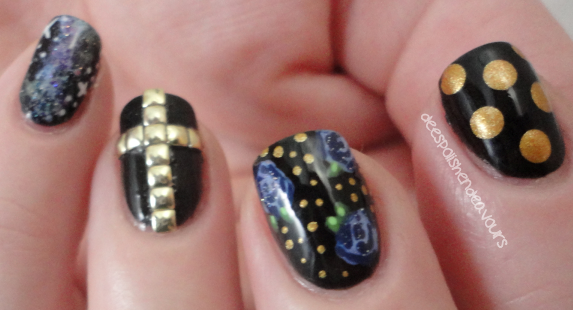 It is black based nails, some gold bullion beads, and a studded gold cross.. I really liked it, and she said they should be my party nails. I agreed. Phew! That is a lot of stuff to use.. but while doing them, it didn't feel like that. I will do a breakdown of each nail.. Here goes.. Thumb & Pinky - Galaxy - Base of black (Liquid Leather), sponged on some white (White on White), pink (Sugar High), yellow (Unicorn), and navy blue (First Mate).. Did some "detail" work with white (White on White), and then globbed on some sparkles (Fairy Dust). Index - Dots - Base of black (Liquid Leather) and used my largest dotting tool to add some gold (Glitz). Middle - Floral - Base of black (Liquid Leather), made the "roses" using a mix of blue shades (Bikini So Teeny and Secret Peri-Wink-Le), did detail work with navy blue (First Mate).. petal work using two greens (Gaga For Green and Pastelchio).. Then they didn't feel complete, so I added gold dots (Glitz) and some sparkle (Fairy Dust) on top of the "roses". Ring - Cross - Base of black (Liquid Leather) and gold studs. I really enjoy "mixed" manis, and I think this particular mix is at the top of my list - for now!! Have an awesome day everyone, and I will see you again soon!! This is just all kinds of awesome! @Freshie - Thank you - I thought so as well! Coachella Dweller & When Monkeys Fly!